My daughter skates faster than I will ever run. as she strokes past the boathouses. Men my own age follow her with their eyes. they’re gone. Nobody but me on this poor stretch of gravel. of course, it is no butterfly, just last year’s wind-tossed leaf. flashing in the sunlight. So far away she could be anybody. Karen Rile is the author of author of a novel, Winter Music. 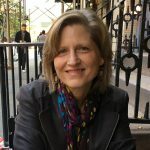 Her writing has appeared in journals such as The Southern Review, American Writing, Painted Bride Quarterly, Creative Nonfiction, The Tishman Review, Belmont Story Review, and others. She teaches creative writing at the University of Pennsylvania, and is the founding editor of Cleaver Magazine. She has a MFA from Bennington College.